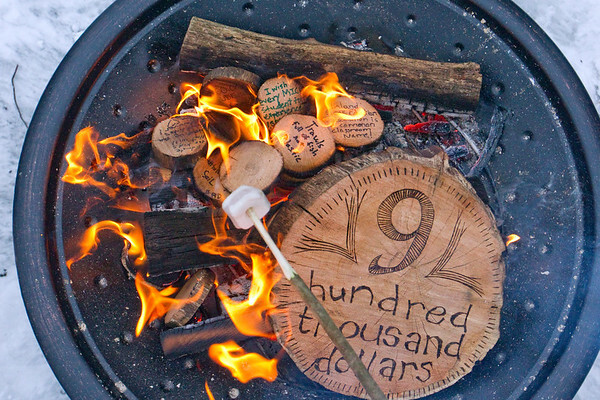 The Inland Seas Education Association celebrates paying off the building's $900,000 mortgage in half the amount of time as previously scheduled by burning a ceremonial mortgage on Thursday at the educational non-profit in Suttons Bay. The fire also included "tree cookies," marked with people's hope and dreams. "In many ways Inland Seas is the result of shared dreams and hopes, and we believe that it will be the same fuel, your dreams and hops, that will ensure we are here 30 years from today," said Executive Director Fred Sitkins. The association was founded in 1989 by the late Tom Kelly, and purchased the building in 2001 from the Northern Lumber Company. It was renovated with an education area, museum, conference room, boat shop, and office space.